In 1997, Jean-Dominique Bauby, famous magazine ‘Elle’ editor in chief awaken from a coma caused by a sudden heart attack. Yet he discovered that he has lost the control of his entire body. The only part that he can move is his left eye. While everything seems lost in a situation that any common person could bear a second, Jean-Dominique, with the help of his doctors learn a new way to communicate. He learns to do it with his left eye and manages, as surprising as can be, to break the silence with his circle of visitors and above all he manages to write his autobiography “The Diving Bell and the Butterfly”. I met Julian Schnabel, the film director, when he was in London for the London Film Festival this autumn. And even if very busy, he was very pleasant and welcoming and took time to answer questions. This interview revealed a very funny and talkative person but not less preoccupied by some existential thoughts. Julian Schnabel might be American but, as surprising as can be, he decided to shoot the e ntire movie in French, with French actors and in France. This choice is understandable for a director whose goal was to remain as close as possible to Jean-Dominique Bauby’s book, and thus to the reality. But what is it like to film in another language with French actors, in France when you don’t speak French? It is worth pointing out at this stage that Julian Schnabel does not speak French. Julian explained how he had to take a crash course in French immediately before starting. For him, this language gap didn’t have to become a problem for the shooting of the movie, ‘this movie is about communicating and the power of learning. So learning how to speak another language help me in many ways’. 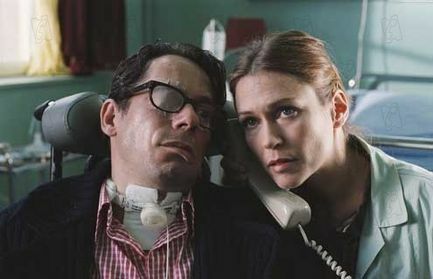 He added that the issue of how to communicate is present through the movie and from the very first scene when the viewers discover the main character, Jean-Dominique Bauby (played by Mathieu Almaric), lying in a bed, unable to move, unable to speak, just able to observe the world through his left eye. For people who are nevertheless hoping for an English version of the movie, note that there will be one available on DVD. Besides these language difficulties, the adaptation of the book by Jean-Dominique Bauby was another real challenge for Julian who ‘doesn’t like when people say things are impossible’, he is one of those people who aren’t afraid to set out to do something without knowing how it will end up. ‘I don’t know what I am to do when I am doing a movie and I don’t work with a safety-net’ . He also claimed not to be one of those producers who starts doing a film with a script, a precise storyboard and exactly knowing what they’re going to do and how much it will cost. ‘As for me, I have always finished the movies that I made on time or before, but when I started them, I didn’t know what I was about to do’. The question is now ‘how did he do that? how did he manage to achieve this kind of miracle without meticulous planning?’. He simply explained that the essential component is trust: ‘I guess that my system of movie making is to read the script and then to translate each part with the different actors in mind. They knew how I felt about their characters. They trusted me. And I think that this point is really important. The only time that any kind of dissidence erupts is when somebody doesn’t trust you. For example, I never had to wait for these actors. In the course of making this movie they were always ready to do whatever I wanted and they were really making things happily. They were amazing, so generous with me, even if I sometimes put them in difficult situations’. 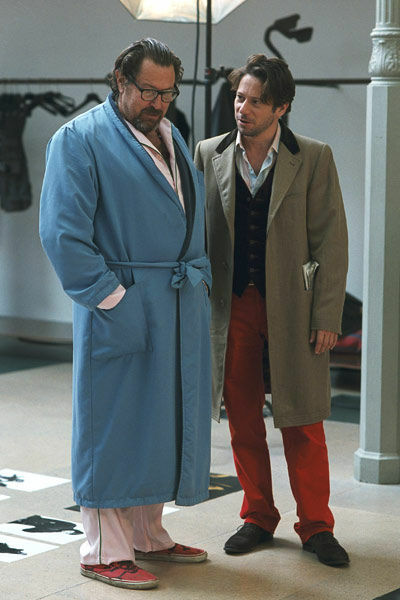 One of these incredible situations Julian Schnabel was talking about is the very first scene of the movie when Jean-Do is lying on his bed at Berk-sur-mer hospital and awakes for the first time after his accident. The director had decided to shoot this scene in such a way that the viewers are only seeing what Jean-Do sees. They are seeing through his left eye. But what was the shooting of the scene like. How can you possibly make this interesting? Julian Schnabel explained ‘It was interesting, a bit like when you do your first film: you have to ask yourself what am I doing. For this scene when people are talking to Jean-Do but he is in a sound box and nobody can hear him, it was quite difficult as I was looking for something unnatural, an emotional intensity’…’The interesting thing about making this film was that physical limitations in these different situations were forcing us to find new ways to tell the story and that was very attractive’. It wasn’t just the shooting of the film that Julian found interesting, he also had to go deep into his own personal reflection. Indeed, Julian Schnabel explained how deeply he was concerned about the death issue raised in the movie. This movie tells the story of a man who survives an accident, and, even if paralysed and unable to communicate except through his left eye, he decides to live this reprieve in a way he would have never done it before and writes a book. This movie tells us about death and awareness of our own death, something Julian Schnabel was extremely, and maybe is still afraid of. He remembered about the sa me fear his father experienced before dying and explained how this movie helped him to come to terms with it: ‘My dad, who died a couple of years earlier at 92, was just terrified. I am also terrified but, by making this film, it was like a self-help device for me. In the movie, Jean Dominique Bauby could articulate his story through his book. And I think that he had a second given to him and finally realising what he cared most in life. My concern is that when I die I’ll just be scared and think that there is no reason for being here. And I thought that in Jean Do’s case, he found something: He started to use his imagination in a way that he never used it. His brain became his instrument and with that he was able to leave his body… And this man started to meditate on his dreams. He started thinking how his life was’. The director first thought of Johnny Depp for the main character, who was at the time not available. He nevertheless specified that even if Johnny Depp had accepted, ‘[he] would have still shot in the hospital and would have still surrounded Johnny with French people and he would have spoken French’. It could help that Johnny is married to Vanessa Paradis and lives in France…and speaks French. Yet, Julian Schnabel was very happy with his final choice: Mathieu Almaric. ‘The great thing about Mathieu…is that he is French! I mean, the things he would say were things that French people would say. He did an absolutely magnificent job. He gave me everything, even more’.